We all know that mostly stars are at the center of planetary systems, but is it possible that instead of a star there was a rocky planet in the center with stars (and other planets and moons) orbiting it? To be more concrete: Is it possible for a star to have the same mass and radius as e.g. the Moon and orbit a planet like Earth at the same distance (at which Moon orbits Earth in actuality)? To further distinguish this from similar questions, I want to further ask whether the star will still be able to shine and fuse hydrogen if its mass and radius would be the same as the mass and radius of the Moon. Or is there a lower limit to the size of a star that can shine and fuse hydrogen? Is it possible for a star to have the same mass and radius as e.g. the Moon and orbit a planet like Earth at the same distance (at which Moon orbits Earth in actuality)? No. 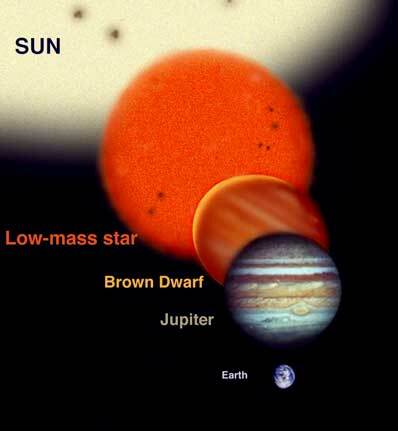 The lowest mass type of star is a Brown Dwarf, which still has a mass greater than that of Jupiter. Even brown dwarfs have too little mass to fuse light hydrogen. Neutron stars can have much smaller radii than the moon, and white dwarfs can be about the same size of the moon, but they have much greater masses. For a star below the 75-80 Jupiter mass cutoff, it cannot fuse Hydrogen-1. Below 13 Jupiter masses, it cannot even fuse deuterium. All of these masses are well above the 5-10 Earth masses that is the cutoff for a terrestrial object. The following image might help to illustrate the relative scales of different astronomical bodies. As you can see, a brown dwarf can only emit the faintest glow and is still much more massive than Earth-sized objects. In short, anything massive enough to fuse Hydrogen and emit light in the visible spectrum would be far more massive than a neighbouring rocky object. So much so that it would always seem as though the rocky object is orbiting the center of the star, not the other way around. Orbits are a funny thing, in space bodies have gravitational effects on one another. In a system like our solar system none of the objects including the sun are truly stationary in relation to one another. Even stars move around based on the gravitational pull of their planetary bodies. this wobble allows us to detect planets in solar systems far away from ours and even estimate their masses. In actual fact bodies including stars really orbit the center of mass of the system (cf the hammer throw example). I would suggest that a star (like the head of a hammer) doesn't always have to be the center of mass of the system and hence a star could theoretically orbit around a center of mass at which there happened to be a planet. In real terms however this would be incredibly unlikely and would not be defined by the mass of the object at the CoM of the system. One plausible scenario where this might occur would be two stars of similar sizes orbiting each other with a planet stuck in balance between them. Could there be a star orbiting around a planet? Why are planets in unstable equilibrium in a stable orbit? Is there any free open source planetary orbit simulator software? How to predict the location of a planet at a given time? Why the Moon does not change its orbit from Earth to an another planet? Can planets orbiting a binary star trace out an orbit in the form of an 8 (or $\infty$-sign)?